Check out the Imaginary Veterinary book! Sean from Fun Kids is always saying he saw the Loch Ness monster a while back when he was in Scotland. There’s a chance it was a floating twig, but we didn’t tell him that. Do you believe in things like the Loch Ness Monster, Bigfoot and other mythical creatures? 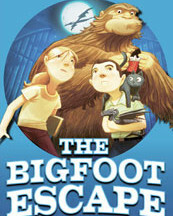 If you do you’ll love the new book The Bigfoot Escape – the first from the new ‘Imaginary Veterinary’ books. It’s all about a boy called Ben who’s forced to spend his Summer with his Grandpa in the boring old town of Buttonville. But things soon spice up when him and a local girl called Pearl Petal come across a secret hospital for imaginary creatures called Dr. Woo’s. Ben accidentally leaves the door of the vets open though, and a big stinky beast escapes. It’s down to Ben and Pearl to get it back!